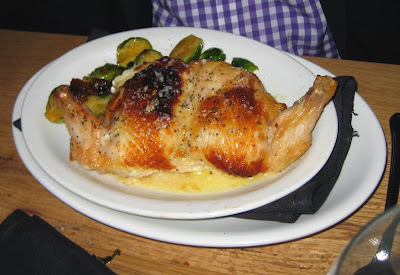 Mr Minx and I were invited to dinner at Grille 620, a new restaurant in the Ellicott City (Marriottsville) area. Located in the new Turf Valley Towne Square complex, a couple left turns off I-70 W exit 83, the restaurant was hopping on a Wednesday night, a sign that the area not only needed a nice restaurant, but that the residents have already embraced it. Grille 620 is owned by Ali Sadeghi and Gaby Haddad--both veterans of Ruth's Chris--and former Baltimore Ravens linebacker Adalius Thomas. 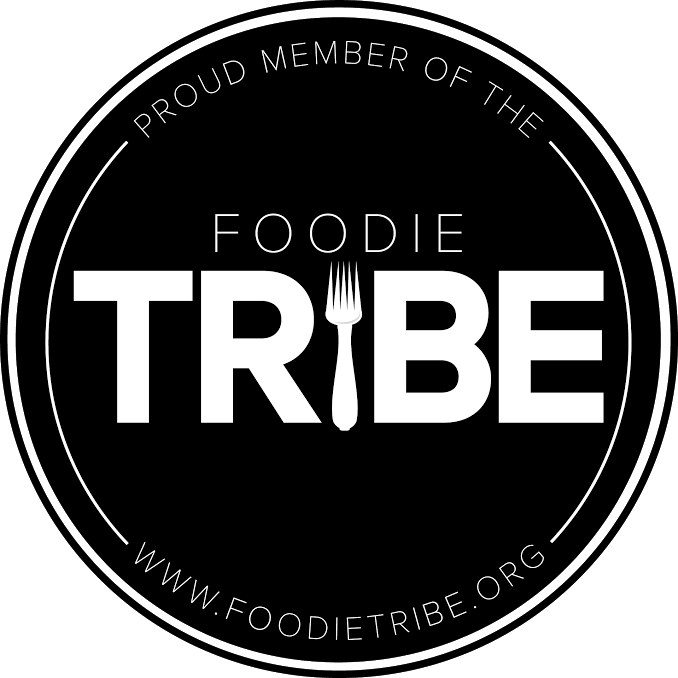 Running the kitchen is Sardinian chef Fabio Mura, whose menu is Modern American with some fusion-y bits. 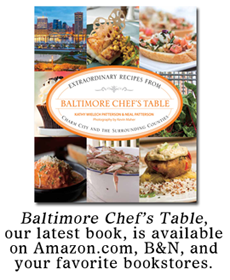 But not too many--mostly Asian touches here and there on familiar meat and seafood dishes. 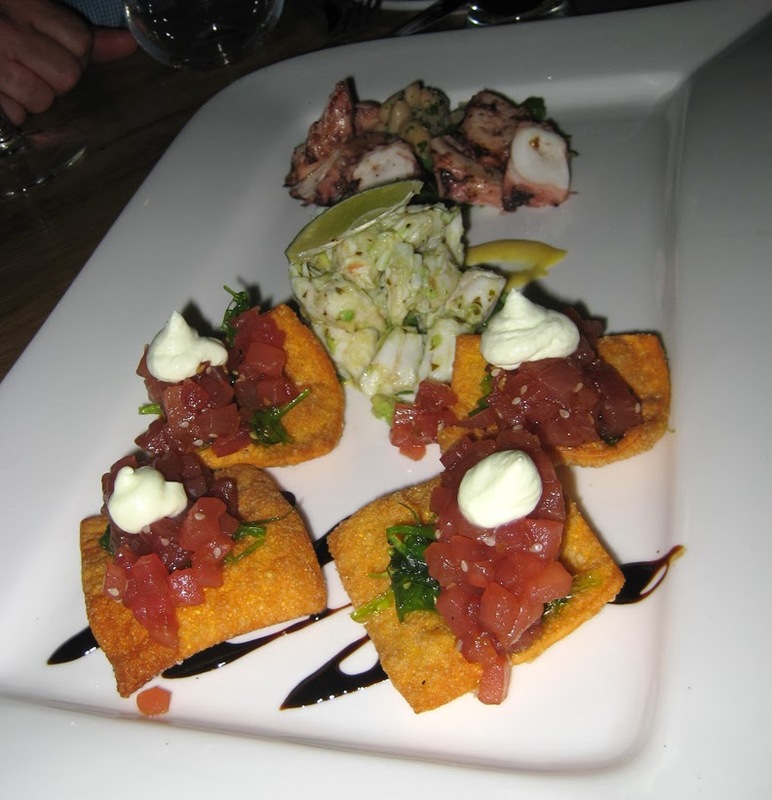 Because we were a relatively large party that wanted to taste a bit of everything, we were presented with an appetizer sampler that included tuna tartare on wonton chips, grilled octopus with bean salad and lemon caper vinaigrette, and a pile of lump crabmeat with a little remoulade. We also received the chef's sampler of the day, a trio of Mediterranean dips including roasted garlic hummus, a finely diced Caprese salad, and Kalamata olive tapenade. Among the appetizers, the most flavorful were the tender octopus (that I couldn't stop eating) and the supremely fresh tuna tartare. We also sampled and enjoyed a selection of fresh oysters, including Blue Points, Malpeques, and some from the Chesapeake, served on the half shell with a tangy mignonette. 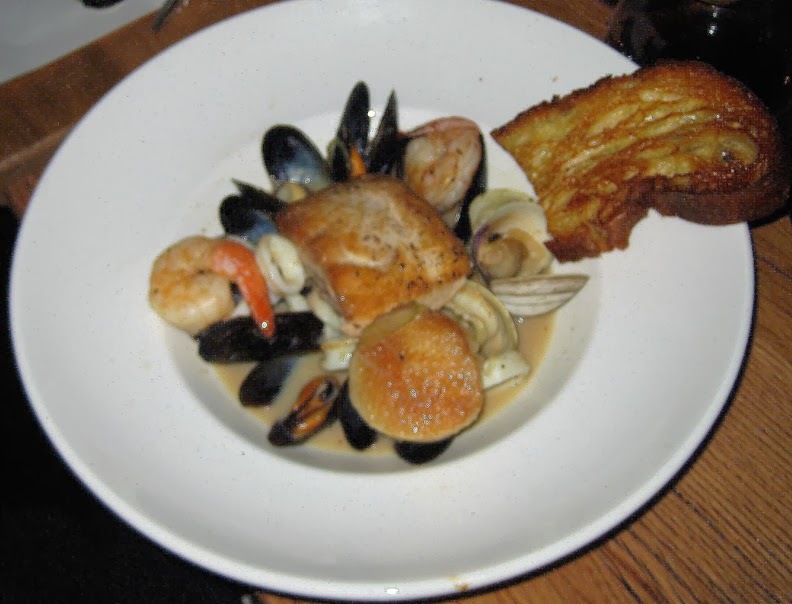 We each ordered an entree and did our best to sample both meat and seafood items. We ended up with a Creekstone Farms strip steak, stuffed chicken, lamb chops, diver scallops, crab cakes, and Thai bouillabaisse, plus side dishes of roasted asparagus, truffled mac and cheese, and three kinds of potato: Lyonnaise, steak fries, and baked. 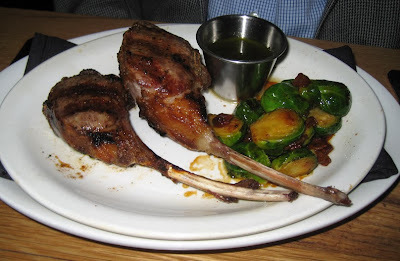 Mr Minx and I had the lamb chops and crab cakes and can attest that both were quite good. 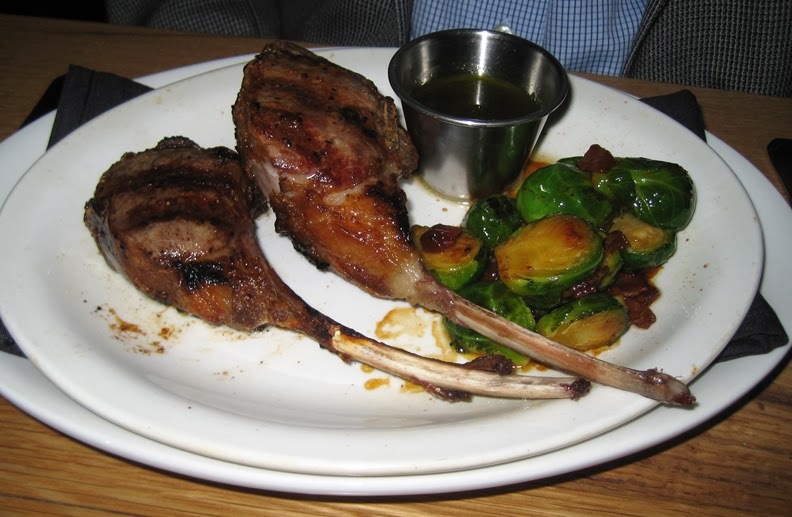 The chops were cooked to medium, and came with a little pile of roasted brussels sprouts and a mint pesto-infused sauce. 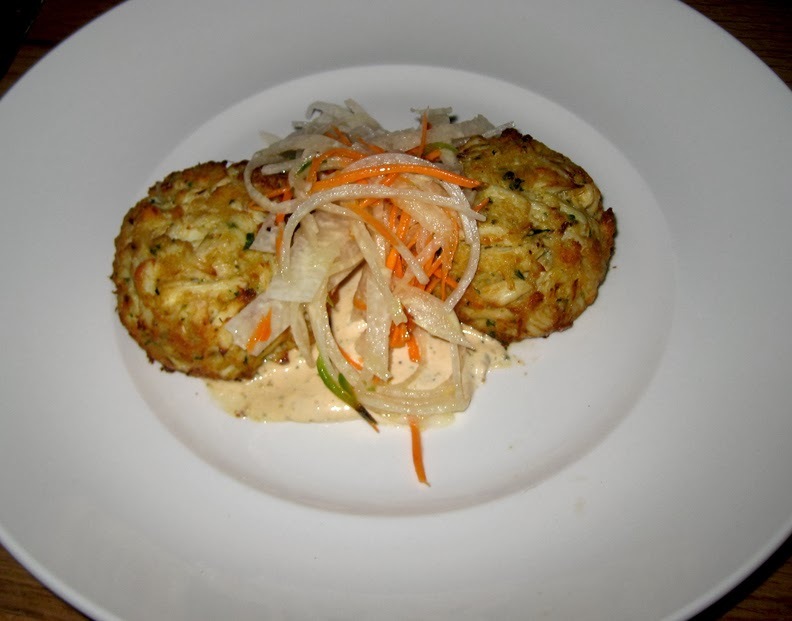 The broiled crab cakes were served with a tangy jicama and carrot slaw and a bit of creamy remoulade. While I like my crab cakes a little darker/crustier on the outside, the innards were the perfect ratio of meat to binder to breading: mostly meat, very slightly saucy, no detectable breading. We also sampled seafood from the bouillabaisse that was ordered by a tablemate. The dish didn't really have anything Thai about it, nor was it particularly a bouillabaisse, since there wasn't nearly enough broth. What it was, however, was a pile of very fresh seafood including a chunk of mahi mahi and a humongous scallop, all cooked perfectly and most likely individually. "Fresh" is the word at Grille 620. They have no freezer on premises, so all of their food is procured not all that long before being cooked; that freshness really showed with the seafood dishes. Another diner seemed very happy with his stuffed chicken. The sides, particularly the potato dishes, were all successes. I'm not a huge potato eater, but I did enjoy the Lyonnaise-style new potatoes. The steak fries (below) were garnished with bacon, and also quite good. 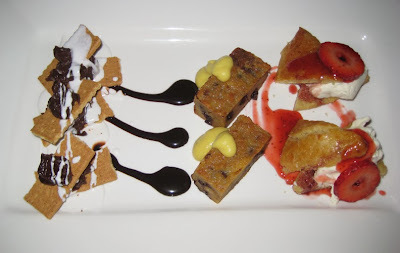 We finished the meal with a trio of desserts, including a special strawberry shortcake, a dense bread pudding, and s'mores made with a rich chocolate ganache. 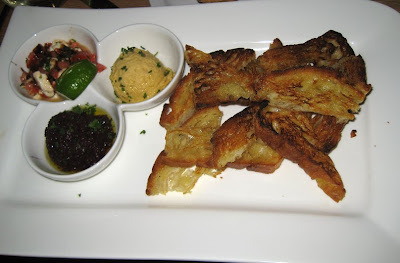 My favorite was the bread pudding, which would make a fine dessert to share.